Happy May June Space Freaks! It’s been an exciting year for the hobby and collectors across the board, with crazy auctions for unique and rare items, to scandals, to plain great discussions on Rebel Scum and at the Imperial Gunnery. This has given Michael and myself along with our counterparts on the Chive Cast great fodder to discuss. At first the idea of this article was to document the insane appreciation we’ve seen in the Vintage line over the past few years, via a grid of pricing and conditions that drive it. However that will have to wait, if not be shelved permanently, as like most pricing grids (guides) they are out of date as soon as they are completed. Instead I’m going to focus this on a few of the overarching situations where collectors jaws drop to the proverbial ground. The situations where you have to take a second look and ask yourself, was that an anomaly or is that par for the course in today’s market? In this month’s article we’ll cover some of the biggest ah-has for today’s collectors in an effort to help level set the community on the reality of some of the most expensive areas of the hobby. Given all the facets that we could cover this month we’ll just be focusing on the first 3 of 6 with a follow up article along with a New General update coming in Late June. But let’s cut to the chase and cover 5 of the biggest reality checks when it comes to today’s market. Interesting as there are infinitely more of the first 12 available on Star Wars 12 backs in existence today than on any other cardback, thus showing again rarity and demand are not always directly connected. 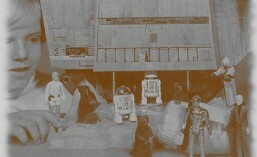 Regardless of their commonality as the most readily available of any Star Wars MOC figures, they continue to drive some of the highest prices of any cardback combination. Today most 12 backs graded in 80-85 condition drive retails in the $800-1100 range regardless of character. Of course some characters like Vader have seen AFA85s go for over $2000 in the past year, thus inside this trend exist certain outliers. The thing that drives the value in 12 backs is the mis-guided perception that the first release is always the most sought after. True in comic books and baseball cards this falsity is mis guided in a toyline that lasted for over 8 years. Impact of Clear bubble on ROTJ and POTF prices. The last two lines in the series were the largest and smallest in total quantity of figures released respectively. In each series there was a trait that would in years to come define the series from a collectors point of view. That being the fact that the seals on the figures bubbles improved, but the plastic quality was diminished and thus the vast majority of the figures bubbles turned yellow over time. When reviewing the AFA database we find that ROTJ MOC graded figures are over 65% yellow, and nearly 80% of POTF figures follow suit with this trait. That leaves the minority of each of the series with clear bubbles. What enhances this is the fact that figures are still “turning” via exposure to sun, heat, moisture, smoke, dust and lack of proper ventilation or storage. Given that the price of clear bubble figures continues to skyrocket amongst the two lines. In the ROTJ world it can mean a 3-4 times lift in value and with POTF it’s very close with a 3-5 times price increase. POTF Amanaman Yellow AFA80 = $125-150 figure, however with a clear bubble the figure has sold for north of $500 in the last year. With figures like Anakin and Yak Face which are almost non-existent with a clear bubble the prices inflation is even more impressive, given the size of the dollars being talked about and the fact that these two have fewer clear bubble figures by ratio and in absolute value then any of the last 17. On the ROTJ front we see a lot of appreciation in value in 65-77 and 79 backs as they represent the majority of the yellow bubble figures in the market with roughly 80% of these cardbacks being graded yellow. With 48 backs it’s a bit of a different story as the bubbles don’t have the same yellowing tendencies. Thus the value increase is more comparable of the last ESB releases vs. the rest of the ROTJ or even the POTF line. Greedo ROTJ Clear Bubble – C8 Prices through history. Tomart’s Price Guide – Outdated Prior to Print = $35-50 top end. Revenge Proofs – Even if there’s 50 estimated to be in existence for each character, there’s something that most prototypes don’t have, a wide base of collectors actually are trying to collect. This shows with out a shadow of doubt that a mix between rarity and demand exists that is not exclusively based on just the rarity. Ex, I want to get a sheet of proof cards for my ROTJ collection, do they exist, Yes, are they obtainable, that’s questionable. Thus I am searching week in and week out for this piece, no because at the end of the day I would have to know someone who had access to the first generation of sales of these items in order to find one, and the chances of finding a one of a kind vintage item is pretty much unattainable for the average collector (someone outside the inner circle) and the legitimacy of some of those pieces is tough to verify. Being that Revenge of the Jedi proofs are obtainable in many collectors eyes, the Revenge proofs can demand double of what some of their ROTJ or ESB counterparts do, even if they out number those proof series 10-1 in many cases. Thus we have a relationship between the perceived obtainability of an item that creates more collectors and thus drives up the price more and more regardless if there are 50 examples out there. – Tertiary Background characters such as Bespin Guards, and Lobot demand roughly $200-$300. – Secondary characters such as Greedo, Bossk, IG-88 and others usually realize prices of $250-$400. That wraps up our update for this month, check back next month for our normal Monthly Updates for June and for the next phase of come back to reality where we cover, Boba Fett, Darth Vader, High Grade AFA.